I grew up in a household that used camp walls at larger events. 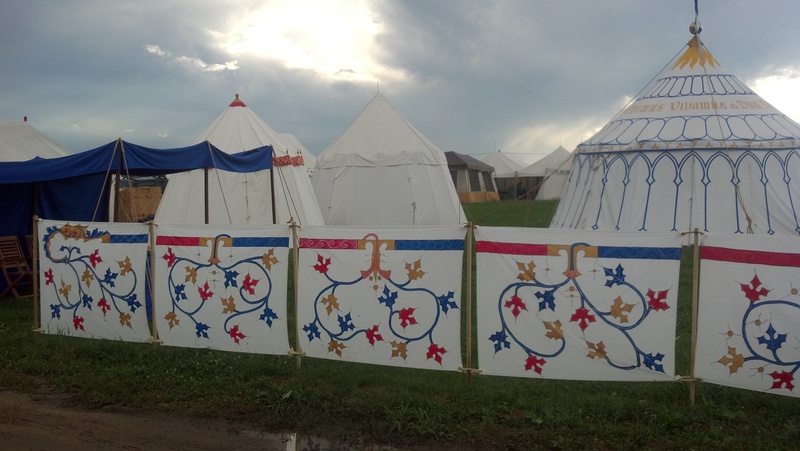 They were usually just simple posts with rope or fabric strung between them, but they gave us some definite camp boundaries, and they helped to control the “cut-through” – people walking through the middle of our camp. 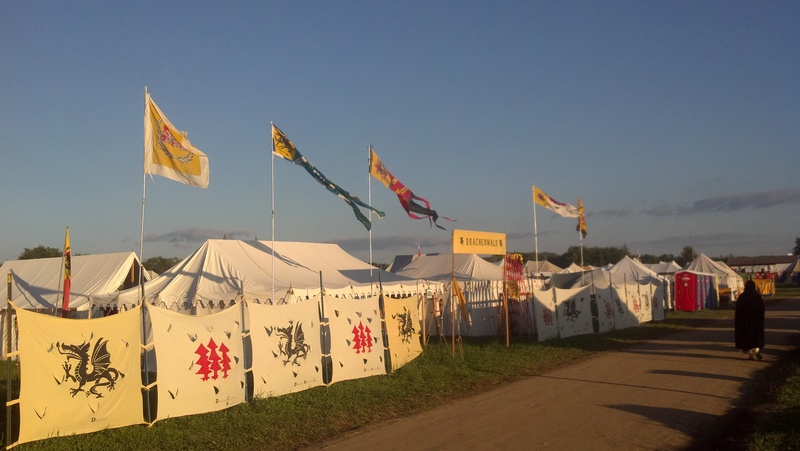 At bigger wars, like Pennsic, a definitive gate with Tiki torches and a banner, made it easier for people to find the camp entrance and announce themselves to the camp. Our own household maintains the same simple esthetic today, with the only change being the substitution of solar lanterns for Tiki torches. If you want to have walls for your camp you need to consider materials, execution, and storage, not necessarily in that order. What are your goals – complete privacy, heraldic display, household identity? How quickly does your wall need to go up? How many hands will be available to put up your wall? What do you want to make the wall out of? Where are you going to store the pieces when the wall is not being used? Only you can answer these questions for yourself. The most basic wall structure is the pole and rope border that our household uses. We use green tomato stakes and a ½ inch red and yellow rope from Home Depot. A large tent stake and mallet is used to make holes in the ground and then insert the poles. The rope is simply tied to each pole in turn, leaving a slight swag between the poles. We used this form of wall for two or three years before I had the time to make small triangular pennants to fly from the top of each pole. It isn’t fancy, but it makes it easier to spot our camp from a distance. 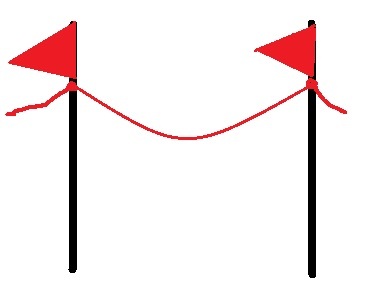 The next step up from the basic rope border is using fabric panels between the poles. The poles can be rebar, metal T-posts, metal pipes, wooden clothing rods, wooden posts, or just about any other sturdy support that you can afford. The posts can be short or tall, depending on the size of your panels. The panels themselves can be plain or decorated in any way that you would prefer. 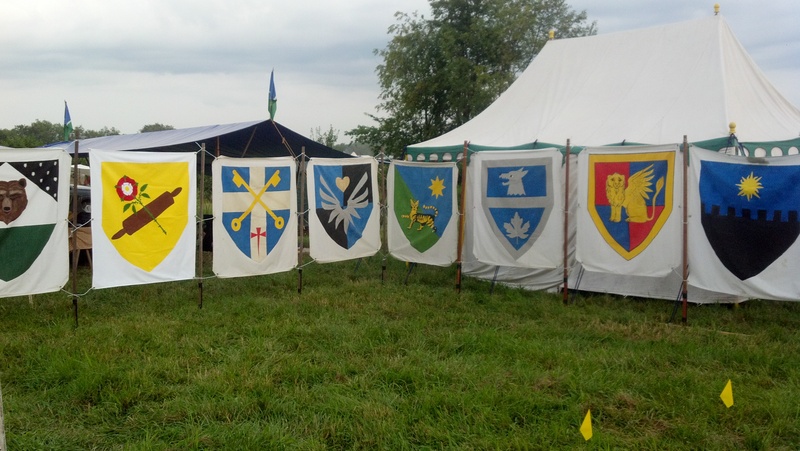 They are an excellent opportunity for heraldic display. Short walls with panels that are about 3 feet by 4 feet. Each panel has four grommets to tie the panels to the poles. This pattern is found in many illuminations. Six foot walls with heraldic display. Each panel has six grommets and uses sturdy clothesline to tie the panel to the poles. Large fabric panels with slits to relieve some of the pressure from the wind. These panels are about five by six feet. The panels are held in place with fabric loops. Many of the panels have been sponsored by an individual or group – they receive credit in the lower right hand corner of the panel.